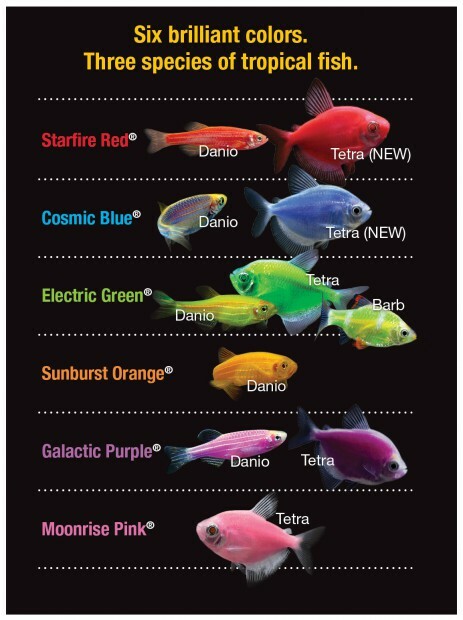 Glofish were originally bred to help detect polluted waters. Want to know how to best show off your Glofish? Click here to continue reading! This winter has been absolutely brutal in most of these United States. So, let’s shift our thoughts to warmer things, like that pond of yours. Now is a good time to go through your spring cleaning checklist so you can hit the ground running come that first break of warm weather. Check your pond for any areas that may require repairs, such as rocks that have displaced, a tear in the liner, and broken piping or valves. Remove any accumulated debris from the pond bottom and surface. Remove and dry your de-icer (if applicable), inspect it, then store properly for next season. Inspect and replace hoses, and tighten any fittings that are leaking. Start up your pump and filter in shallow water to ensure everything is working properly (there’s nothing worse than putting it the bottom of the pond only to discover you need to take it out again). 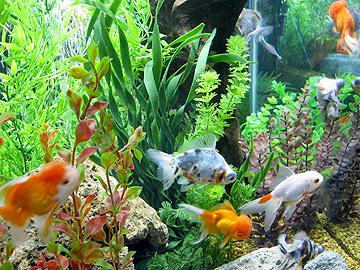 Replace up to 25% of the pond water with tap water. Remember to add a water conditioner to remove chlorine, chloramines and heavy metals found in most tap water. Take a good look at your fish. Examine their activity, ensure they are not struggling or swimming oddly, and inspect their fins and scales to ensure they are healthy. Begin feeding according to seasonal feeding cycle. For more from Tetra’s latest newsletter, click here! There’s no doubt the primary driver for homeowners to add a pond to their landscape is to create a place of beauty and relaxation where they can escape this hectic world. Another benefit is increasing their home’s living space by adding an outdoor living room around the water garden. There also seems to be a constant change in energy costs, as well as huge shifts in our nation’s weather patterns. More and more areas of the country are being affected by extended drought conditions, primarily in the western half of the United States. By replacing some or all of your lawn with a pond or water feature, you can conserve energy, save money, support the environment and have a beautiful place to relax! Lawns require watering; whereas, ponds can be re-filled with rainwater. Ponds are a self-sustaining cycle of hydration that keeps plants alive without having to water them. Less mowing means less use of gas and carbon monoxide emissions. Pesticides and fertilizers for the lawn can be harmful, creating run-off that ends up in groundwater, streams and rivers. Sludge collected by your pond filter can be used as a nutrient-rich fertilizer for your flowerbed and garden. Ponds attract and create a haven for beautiful fish, dragonflies, frogs and birds, adding to wildlife propagation. Water gardens influence the young to help create a better future for the planet. Remember, every little bit helps, especially when it comes to water conservation. And these are just a few things you can easily affect, right in your own back yard. 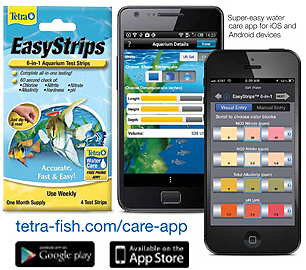 Check out their new water care app by visiting this spot on their website: http://www.tetra-fish.com/care-app.aspx It’s free and works with their pH strips to help you better understand and evaluate the pH of your pond water. In other news, make sure you check out the TetraPRO Nutrition Line. It provides better nutrition for your fish because it’s made using a low heat process that allows it to lock in all those great vitamins and minerals! Now that the days are growing shorter and temperatures are getting colder, your pond and its inhabitants are beginning to get ready for winter. There are important things to do now to help your ecosystem adapt to the upcoming harsh months. Will it be a mild season? Or, will it be the harshest on record? No one knows for sure. If you have trees close by, it is advisable to place a meshed net over the pond in order to prevent falling leaves dropping into the water. Although the net may look unsightly, it only needs to be in position while the leaves are falling, and is easier than removing the leaves from the pond by hand.